Can a Freestanding Wine Cooler be Installed Under a Counter? Learning Center / Latest Articles / Wine Products & Accessories / Wine Refrigerators / Can a Freestanding Wine Fridge be Installed Under the Counter? 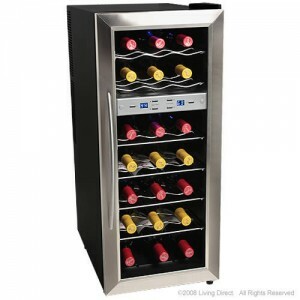 Question: Can a freestanding wine cooler be installed as a built-in unit? This is, by far, the most frequently asked question about wine refrigeration. And the answer is no. 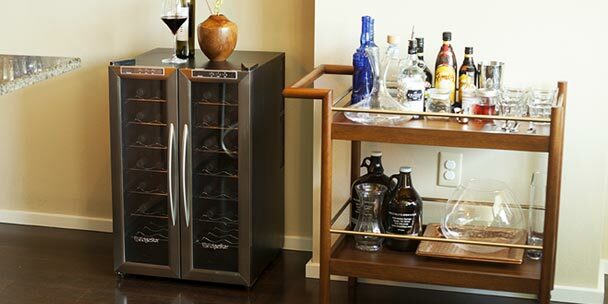 A freestanding wine refrigerator should never be installed under a counter. 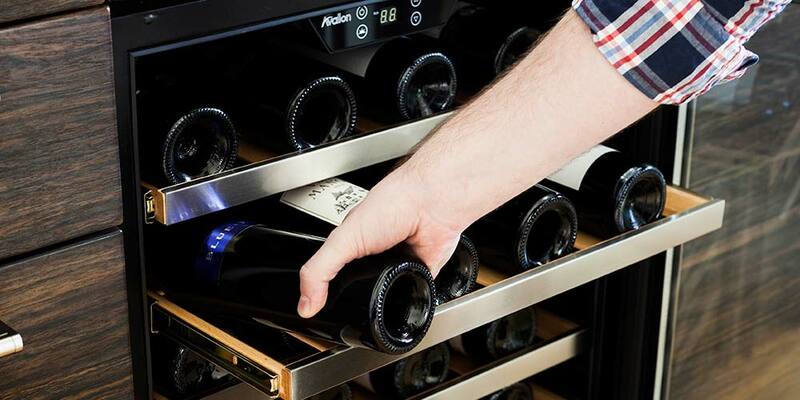 If a wine fridge (freestanding or built-in) were to be placed in a hot garage, it would put a strain on the system because it would have to work much harder to reach the low temperature needed to store the wine and maintain that temperature. The same thing happens when a freestanding unit is placed under a counter. Built-in wine fridges have vents on the front of the unit, so when it is installed under a counter all of the heat is able to dissipate into the air leaving the wine and wine fridge unharmed. 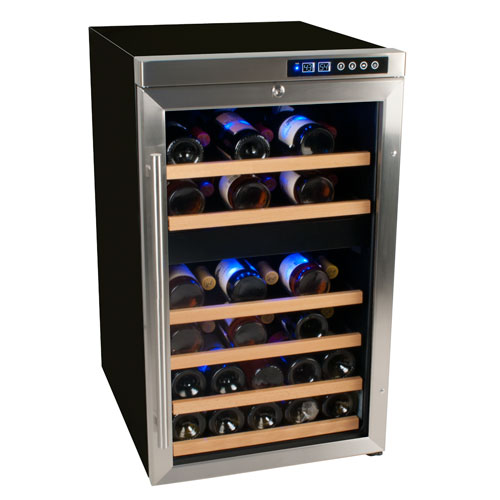 They do cost more than freestanding models, but after you calculate the cost of the wine you might lose, the cost of the freestanding wine cooler and the cost of the wine cooler you’ll have to buy to replace it, you’re much better off getting a built-in unit to begin with. 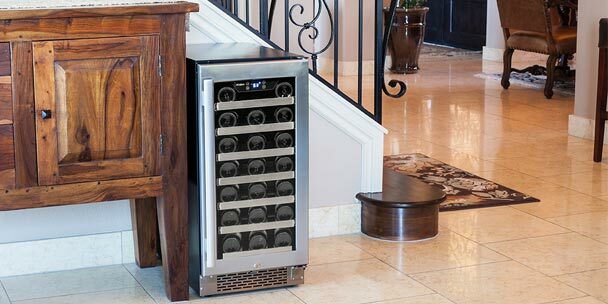 The best use of a free standing wine cooler is to make sure you have it in a place that is out of the way of direct sunlight, in a temperature controlled area. Also, you need to make sure to leave 2 to 3 inches on each side, as well as 3 to 4 inches in the rear for the unit to vent properly. That, combined with cleaning the back of the unit where the cooling unit is will ensure that your free standing wine cooler will last a good long time. I have a wine cooler that I was going to install in a cabinet. It fits very snugly. I have about 5 inches from the back of the cooler to the back of the cabinet and since it is the end cabinet I was planning on drilling a few ventilation holes toward the back. Do you think this would allow enough ventilation to keep the cooler working? `That sounds like it will work. You just have to be certain that the heat coming off the cooling nodes can be dissapated. If you have the 5 inches in the rear, and a completely open side, drilling the holes in the back will also help to remove the heat from the unit. Our builder installed a free standing wine fridge under our counter. The back of the counter faces the open living room area. Is it possible to simply install a vent in the drywall of the back to allow the unit to vent well enough to keep it there. 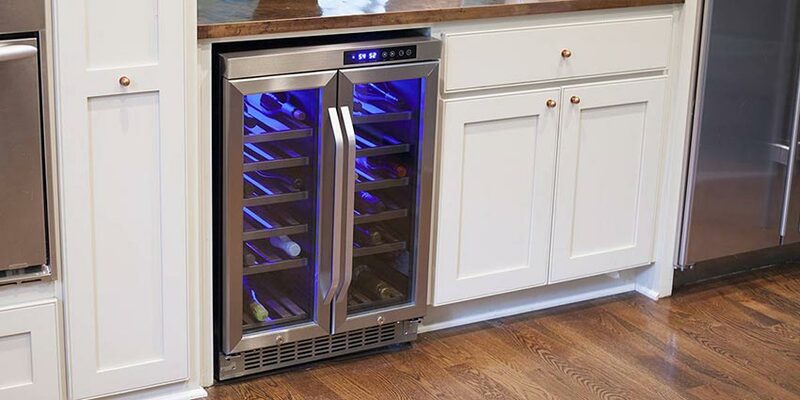 I have searched for similar front venting wine fridges to replace it, but none of them are the same size to fit the already installed cabinet/counter area. I have the same problem in that I have a 21″ wide space under my counter top and built-in coolers seem to be 15″ and 24″ wide – no 18″ or 21″ versions that I can find – and they’re hundred of dollars more expensive. I’ll put in a freestanding wine cooler but actively vent the back area. I’ll do this by cutting an hvac register size hole in the wall behind and towards the top of the unit (heat rises). I can then use a $12 standard register grille on one side of the wall and a $48 flush-mount register booster fan on the other. Running the booster fan in constant-on mode at lowest (and quietest) speed should pull any warm air out from behind the cooler, drawing ambient air in from the front through any gaps around the bottom and sides. Yes, that’s more power usage, but at around 5W should be about 3.5 kWhours per month, less than $1. I’ll post how it works out. If I buy a built in to put inside a cabinet with a door on the cabinet would that overheat unit? Or would front of cabinet door need to be removed? Does a wine fridge suppose to build up ice inside back wall?